The Shahnameh is a long epic poem written by the Persian poet Ferdowsi between c. 977 and 1010 CE . It is the national epic of Iran (Persia). It consists of some 50,000 verses telling the mythical and some of the historical past of the Persian empire from the creation of the world until the Islamic conquest of Persia in the 7th century. It is similar in status to the Arthurian legends in the UK, every child grows up knowing the stories. 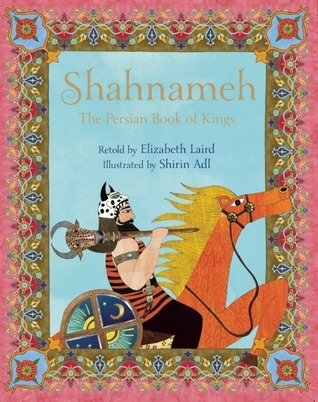 This book is a retelling of some of the stories of the Shahnameh aimed at children. It was the only version that my Library system had but I have to admit it would make grand reading to or with children. It begins with the story of Kayamars, the First King where the devil Ahriman is also introduced. As Kayamars, his sons and grandsons improve the lot of man, Ahriman bides his time and “lurks secretly in a far-off lair” before the “worm of pride” brings down the reign of Kayamars, great-grandson Jamshid and God removes his kingship. Meanwhile Ahriman has taken hold of Arabia by conspiring to murder its King and place his son Zahhak on the throne, Ahriman turns Zahahk into a evil war mongeror, placing two black snakes protruding around his head which need to be fed by the deaths of two people every day. Zahhak dreams of being conquored by a hero called Feridun. Feridoun’s mothers hides her child in the mountains, with cows and with holy men until he is old enough to successfully take on Zahhak. The next story is a classic “love across the divide” tale, the story of Zal and Rudabeh, in which the son of one of Feridun’s champions falls for and eventually marries the daughter of King Mehrab of Kabul a follower of the Zahak. Zal is left for died in the mountains by his father for having been born with unusual white hair. There he is raised by a giant bird, who graciously returns Zal to his father when he has a change of heart regarding the boy. This story has Rudabeh lower her hair down for Zal to climb up, very similar to the Rapunzel fairy tale by the Brothers Grimm. It never fails to amaze me how irrespective of culture folk stories and fairy tales have the same themes – good versus evil, jealousy, love, friendship etc. – all the basic human emotions. The the story of Rustam, Kal and Rudabeh’s son, who becomes the nation’s champion. Rustom fights the fiercest elephant when still a boy, acquires his horse Rakhsh and sets out to find Kay Kobad who will become King to fight off attacks from neighbouring Turanian prince Afrasyab. However, Kay Kobald’s son, Kay Kavus, was not like his father and when the devil disguised as a musician tempted him with the delights of Mazanderan he tried, against all advice, to invade and take that country which was ruled by the White Demon. He and his generals ended up blinded and prisoners of the White Demon. Rustam is sent forth to free them. He has to pass seven trials en route and with the help of Ulad finally kills the White Demon and frees Kay Kavus and his generals, installing Ulad as King of Mazanderan. But Kay Kavus was not done fighting and raised his standard against the King of Hamaveran, subdued him and married his daughter. But the King rebelled at this and once again Kay Kavus and his generals were imprisoned only to be freed once again by the heroic Rustam. The devils were not done with Kay Kavus and persuaded him to go on and conquer the heavens. Kaya Kavus built a throne or wood and gold, which had 4 powerful eagles strapped to it chasing meat held on lances attached the the throne. Thus Kay Kavus flew higher and higher into the heavens until the eagles were exhausted and Kay Kavus fell down to earth. Finally repenting of his pride and folly he was forgiven by God and reigned peacefully for the rest of his days. Rustam’s horse was stolen by Turanian horsemen and taken to Samangen. When Rustam approached the King of Samangan for his help in locating his horse, he met and married his daughter Tahmineh. Upon the return of his horse Rustam returned to Iran, keeping his marriage secret and leaving Tahmineh in Samangen to give birth to his son, Sohrab, who grew strong like his father whom he had never met. But the overlord of Sohrab’s family was Afrasyab, an enemy of Iran, who when he heard that Sohrab was raising an army to attack Iran and find his father planned that Sohrab should not discover who was his father and so would end up facing him in battle. This battle was a tremendous fight between the two men. Each had seen signs that the other was a relative but had been swayed by falsities from their advisors so they did not believe their own eyes. Rustam brought Sohrab down and as he lay dying the whole sad story comes out and Rustam is consumed by grief, having killed his own son. I loved these stories, and can well imagine children in Iran being brought up on these tales and playing Rustam and Sohrab games and dreaming of a love such as Zal and Rudabeh found.